We have been growing for years without chemicals. There is a massive list of things that can be purchased and we don't purchase a single one. Last year, we needed to pick the potato beetle larva off by hand. It took a couple of us quite a few days to get rid of them. This year? The song birds are here, and they are snatching up every soft sided bug larva they can. We have seen a few beetles but not many. The peas had aphids early on, but with spaying them off with the hose and then the bugs that live for aphid consumption the pea yield has been strong...about 6 weeks of lovely, tender, sweet peas. Nothing like what you think of peas. This appeared the other day. 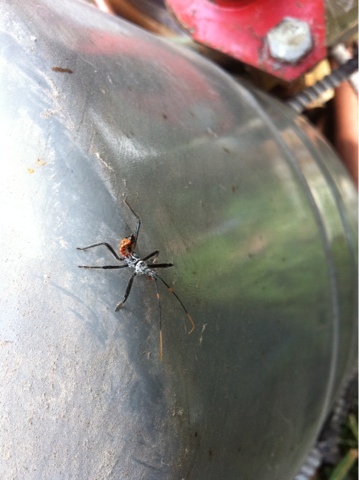 Our bug id came up with an assassin bug...we just love that...it eats massive amounts of other, plant damaging bugs. And it looks like a bug that deserves such a name. Happy to use this bug, and many others like it, as our bug patrols. Hold that chemical cocktail, thank you very much.